The dispute between Amazon and Hachette has continued long enough that it probably qualifies as trench warfare. Everyone seems to have an opinion about the conflict, even though neither Amazon nor Hachette is being very specific about their positions. Amazon clearly wants to lower ebook prices, and Hachette wants to keep them higher to avoid cannibalizing print sales. Amazon has flexed its muscles by refusing to discount books by Hachette authors and limiting their availability, among other things. OK, fine. I can understand how authors, even non-Hachette authors, could be angered and possibly worried by Amazon’s actions. But here are some things I don’t understand. Why is the New York Times presenting such a one-sided view of the war? Here is their latest article, titled “Literary Lions Unite in Protest over Amazon’s E-book Tactics”. Well, I suppose it’s news that authors like Philip Roth and Ursula K. LeGuin have come out in opposition to Amazon, but you will search in vain in the article for a quote from anyone supporting Amazon. It’s not like they are hard to find. Huh? The matter at hand is a contract dispute in which Amazon wants to sell Hachette’s books at a lower price. How do we get from there to censorship and total control of publishers, authors, and readers? And how is Amazon making books impossible to get? I went looking for a book to buy my lovely wife for her birthday. It happened to be published by Little Brown, a Hachette company, so it wasn’t immediately available. I went over to the Barnes & Noble site and found it there. I didn’t want to pay extra for shipping to get it in time, so I stopped in at the Barnes & Noble store and got it there. Slightly more expensive and more inconvenient than getting it shipped to me by Amazon Prime, but no big deal. Why don’t the authors focus on the more basic issue? Lee Child mentions it in this colloquy with J. A. Konrath: Why does Amazon care so much about ebook prices? One thing few people know about me is I love ironing. I just moved, which was a great excuse for a new ironing board. I checked Amazon, naturally, who had boards ranging from $18 all the way to $220. Has Amazon approached the expensive manufacturer and said, “C’mon, pal, America needs cheaper ironing boards! Think of the children!” No, it said, “Sure, throw it up on the site and we’ll see if anyone’s interested. We trust our customers to decide for themselves.” . . . Can you explain in detail why the e-book market shouldn’t operate the same way as the ironing board market or the amplifier market? Why do e-book buyers – uniquely – need Nanny Amazon to save them from deciding for themselves? Are books special? Are they different? Or are there others factors in play? Well, I don’t know the answer to that. Why does Amazon care so much about ebook prices? I assume it’s because of the Kindle. Amazon wants t ebooks attractively priced so people will want to read them on this device that Amazon sells. But I don’t know. Why do self-published authors go against their own self-interest by supporting lower ebook prices for books from traditionally publishers? If Hachette wants to charge $12.99 for their ebooks, isn’t that good for those of us charging $4.99 and less for books that are every bit as good as Hachette’s? But most self-published authors that I’m aware of are firmly on Amazon’s side. One reason, I suppose, is that Amazon has done right by these authors, and as a result they approve of Amazon’s model — lower prices leading to more sales. More people reading more books is just a good thing. It sure is an interesting time in the world of publishing. 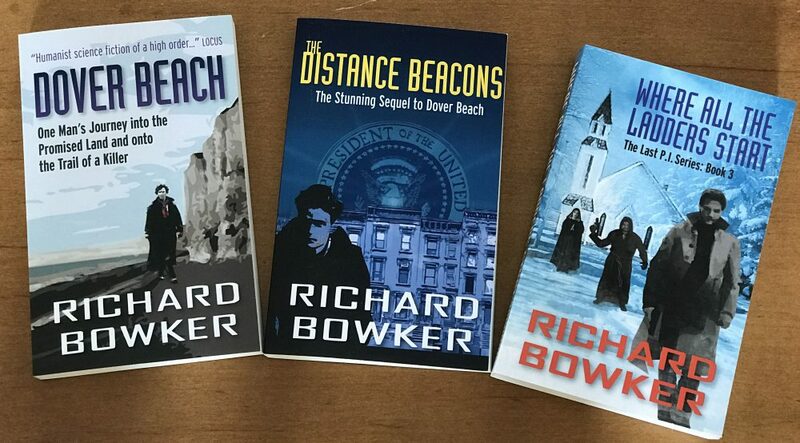 This entry was posted in Ebooks and tagged Amazon, ebooks, Hachette, publishing, writing by Richard Bowker. Bookmark the permalink.